As a Protection Warrior you can tank with the best of them and while Warlords brought a lot of changes for the tanking Warrior (you can see them here) it didn’t change your effectiveness. Not much changed in either 6.1 or 6.2. This Protection Warrior guide is primarily intended for use at level 100. in PvE environments and Raids, not for PvP. However, all of the principals show here will still apply during the leveling process, so if you’re looking for advice on leveling your Warrior, check out our Warrior Leveling Guide. Talents can be changed as often as you like, just like glyphs, for the cost of one Tome of the Clear Mind, available from your Reagents vendor. Buy a stack or two and switch talents when you need to do so. All three talents on this tier are useful and your choice should be based on the encounter. For example, if rapid target switching is needed, then double time is the pick. Short cooldown: Juggernaut is best used for when you need to Charge on a semi-frequent basis. The short cooldown is rather nice. You gain rage on every charge. Stun: Warbringer is for stunning adds/trash (not bosses) and otherwise is not a better option than the other two. The stun can act as a useful interrupt for a caster add that wanders by, though. If you’re on “add duty” then it’s worth considering, esp. if you do not need the shorter cooldown of the others. All of these bases their effects on your maximum health level, so will have greater effect when your Last Stand is active (30% increase to your Max Health for 15 seconds.) They will also take advantage of the increased health from your Commanding Shout ability, if you’re using that. 30% Heal: Enraged Regeneration is a great on demand survivability mechanic, especially if you don’t want to add another strike to your rotation. Has the advantage of being usable while stunned and just ease of use. Leech: Second Wind seems generally useless for tanking duties, since when you’re that low you’re going to need a much bigger heal than Leech can provide. Cheap heal & strike: Impending Victory is perhaps the most useful of the three as it can be used on demand and more frequently than Enraged Regeneration for a very low rage cost. If you have room in your rotation you can use it as a filler attack. Note that it requires a target in melee range, so you cannot use if the boss/target is out of range or otherwise cannot be attacked. Shield Slam: Heavy Repercussions increases Shield Slam damage when you have either Shield Block or Shield Charge active. Shield Slam provides some decent damage, Sudden Death provides a lot more DPS. More Executes: Sudden Death gives your autoattacks a chance to proc free Execute, which can also be used on the enemy regardless of its health level. If you’re using two one-handed weapons you will get more procs, but they won’t hit quite as hard. Much more “RNG” than the others, but overall has the best total DPS. Lower costs: Unyielding Strikes cause your Devastates to lower the Rage cost of Heroic Strike, which can stack 6 times for a 30 point reduction. Sudden Death is still better. What do you need to do in this fight? Note that if Survival is the issue, rather than DPS or control, then consider delaying thes use of these and using Devastate, or other survival cooldown, instead. Ranged stun: Storm Bolt stuns the enemy and does a small amount of damage. Great for the adds that it works on. Against immune targets, such as bosses, it does 4x the normal damage which makes it a decent strike anyway. If you’re on “add duty” then it’s a useful interrupt. Cone stun: Shockwave does nothing to bosses other than a bit of damage, but is nice for groups of adds, especially when they do enough damage to be interesting. When you hit 3+ of ’em you get a cooldown reduction. Take this if your fighting those group when switch when it’s Boss Time. Great for 5 mans. Area damage: Dragon Roar is the best of the three for damaging groups and is as good as Storm Bolt for single target. It blasts everything in the Anything actually knocked down by your roar (it won’t be the boss) will be interrupted. Note that it’ll also add your threat too all of those mobs, helping you to keep that group paying attention to you. Reflect: Mass Spell Reflection can be useful at times, but is lacking due to the fact that the majority of Raid Boss abilities cannot be reflected. Those that can are not really worth the effort. Eat his damage: Safeguard is useful as damage reduction for your ally, but you have to be wary of the damage you might take when using this ability. You charge the targeted ally and he takes 20% less damage over 6 seconds, which might have occasional use, if you pay attention to other team members. Oh yes, you also eat the damage of the initial attack against him, which might be useful or dangerous. Protect him: Vigilance is similar to Safeguard in that you’re protecting the other guy, but it’s much safer for you. It does not protect him against that big hit, but then again you aren’t eating it. Target damage is reduced by 30% for 12 seconds and your Taunt has no cooldown. Be Vigilant and serial taunt everything in range. Rahhrrr! Avatar – Become mightier for 20 seconds. The long cooldown hurts it’s usefulness, but overall DPS is very close to that of Bloodbath for single targets. Some prefer it over Bloodbath, especially since it gets you out of roots/snares, which might be an important thing for tanks. More blood: Bloodbath is the best of these three for single targets. It works with all your strikes and their Multistrikes. Bleeding targets are also slowed, which is occasionally useful. Area: Bladestorm is beneficial during situations where you wish to avoid losing control of your character or are fighting several mobs. Best of the three Vs groups or 2 or more, esp. if they’re fairly short lived. Use a macro with /cancelaura in it if you need to cancel your Bladestorm to, say, intervene or charge. Reduced cooldowns: Anger Management reduces the cooldown of a number of abilities, depending on how much rage you spend. Use this if the encounter mechanics make Ravager a poor choice. Some people really prefer this one though, since it’s a passive. This talent can provide the best DPS if you’re using your Rage for DPS, rather than for damage mitigation. Area & Parry: Ravager is very nice except when the opposition is likely to move away from that area. It deals solid area damage for ten seconds and gives you a solid Parry boost for 11 seconds. Not to mention the added threat form the area damage. It’s a “fire and forget” Bladestorm that you throw. Note that while you’re doing this you’re spamming Revenge (cooldown resets every time you Parry) and building lots of Rage and life is good. This makes Ravager a fine single target ability. In Warlords there are some glyph groups, such as three that modify your Charge, and each glyph in a group will be exclusive, meaning that you can only load one at a time. More Rage: Glyph of Bull Rush gives you more rage from your charge, which is generally useful. Rage isn’t generally an issue, though. Glyph of Cleave allows your Heroic Strike to hit two targets. Glyph of Wind and Thunder increases the radius of effect of both your Thunderclap and Whirlwind, which is a help towards group management. Glyph of Rude Interruption lets you do more damage after pummeling. If you’re in charge of interrupting adds/caster trash (anything that can be interrupted) then this is a very good glyph. More Rage: Glyph of Unending Rage adds 20 rage to your max Rage pool. Glyph of Shield Wall for those times when you need a lot of damage reduction, but you won’t need it often as the cooldown is now 5 min. Use in those fights when you expect a major tank-crushing hit. Glyph of Enraged Speed – Move faster when enraged. Glyph of Intimidating Shout keeps your feared opponents from running about, causing chaos. Warlords killed off Hit and Expertise and brought three new stats: Bonus Armor, Multistrike, and Versatility. Strength provides Parry and Damage. You cannot gem or enchant for it and what you find on your gear will be enough. Bonus Armor adds to your armor and your attack power. You will only find it on certain pieces of gear and gear with this stat will be better than any comparable gear without. Critical Strike is a pretty good stat as it can trigger your Enrage and also adds Parry from your Riposte ability. Critical Shield Slam hits give you free, critical, Heroic Strikes. Versatility is a direct add to your damage, to any healing you do, and (at half value) to your damage reduction, The latter is what make it more interesting that the last two stats. Haste sounds great, but Protection actually gets little benefit from it. *Multistrike gives you two chances (at your % chance) at an additional strike at 30% effect. Your autoattack Multistrikes proc Blood Craze, which is a small heal. Some people really like that heal and so value Multistrike a lot more highly than in the priority list above. It will depend on your gear, your healers, and the encounter. If you healers can do the job then you don’t need it. If you’re more self-sufficient, then you might. Experiment and see how it works for you. 7 Execute – Big hit when enemy is 20% or less. Sudden Death Execute procs can hit enemies at any health level. 10 Bladed Armor (P) – Your armor also increases your Attack Power. 10 Resolve (P) – Increases your healing and absorption done to yourself, based on damage taken (before avoidance and mitigation) in the last 10 sec. You should see effects on abilities like Shield Barrier, Impending Victory, and Bloodcraze. 10 Sword and Board (P) – Your Devastate can reset your Shield Slam cooldown and increase the Rage generated by 5 points. More Shield Slams, even more Rage, and more Heroic Strike procs. 10 Ultimatum (P) – Critical Shield Slams proc Heroic Strikes. 10 Unwavering Sentinel (P) – More stam and less damage taken. 14 Enrage (P) – Critical Block, Dev crits, and Shield Slams Enrage you, for yet more Rage and more damage. 14 Thunder Clap – Blast all enemies in the area for damage and it also slows them. Causes the target(s) to bleed (post level 32) thanks to your Deep Wounds ability. 18 Shield Block – Blocks Melee attacks. Two charges, each last 6 seconds, with a 12 second CD, this should be up pretty much all the time. Note that it’s 60 Rage, just something to spend all that Rage you’re building elsewhere. 26 Devastate – Whack him, chance to reset Shield Slam cooldown. Causes the target to bleed (post level 32) thanks to your Deep Wounds ability. 30 Revenge – Whack up to three enemies, generate rage, cooldown is reset by your Dodges and Parries (which is why this works so well with your Ravager talent. 38 Last Stand – 30% increase to current and max health for 15 sec. 48 Shield Wall reduces all damage by 40% for 8 sec. Best used if you can anticipate a big hit and cast this first. 56 Demoralizing Shout reduces all damage done by nearby enemies by 20% for 8 sec. 60 Bastion of Defense (P) for more Block and Dodge and faster Shield Wall cooldown. 76 Riposte (P) – your crit rating adds to your Parry rating. 80 Mastery: Critical Block (P) – higher block chance and more Attack Power. 87 Mocking Banner – This insulting banner forces all nearby enemies to attack you. 90 Blood Craze (P) – your Multistrikes from your autoattacks trigger a small heal. 92+ Improved Defensive Stance (P) for more armor and damage reduction. 92+ Improved Heroic Leap (P) – Using Heroic Leap resets the cooldown on your Taunt. 92+ Improved Heroic Throw (P) removes the cooldown on Heroic Throw. You want to try to keep these up as often as possible. Given the high Rage cost for these two you will have to constantly be working on your Rage generation. If you have a Glyph of Unending Rage it’s possible to have both up, for those situations. It’s important to pool enough rage to use these abilities properly as they’re a crucial part of your damage mitigation. Note that your Tier 18 set bonus (gratz on getting it) affects Last Stand and Shield Barrier. 2 piece set bonus: Reduces the cooldown of your Last Stand by 50%. 4 piece set bonus: Shield Barrier‘s effect is increased by 200% when used during Last Stand. Shield Block – Blocks physical Melee attacks. Does not block magic attacks, bleeds, or giant spikes pushing up from the ground. Try to have enough Rage to use this when you need it. Using shield Block while the effect is still active will simply add to the duration of the current buff, meaning the effect isn’t wasted. Shield Barrier – Base 20 Rage, costs up to 60, absorbs lots of damage for 6 seconds. This ability is much superior to Shield Block when facing magical attacks, bleeds, giant spikes, and so on. Shield Barrier does not stack and cannot be used again so long as the previous barrier is active unless the new barrier has a greater absorption effect than the current shield. Shield Wall reduces all damage by 40% for 8 sec. Spell Reflection has pretty limited use as you usually can’t reflect Boss spells. Last Stand – 30% increase to current and max health for 15 sec. Berserker Rage you go berserk, triggering your Enrage (more Rage and more Damage.) It also breaks, and renders you immune to, certain CCs which can be very important. Being Feared by the enemy is not good, so break it with this. Use on Cooldown, though you should save it if you know one of those CCs is coming soon. Ravager (talent) massively boosts your Parry for 11 seconds, which will let you spam Revenges. Heroic Leap is your longest range “Pay Attention to ME!” ability, at 40 yards. The perk causes it to reset the cooldown of your Taunt. You can leap in and immediately taunt any mob not paying attention to you. Taunt resets the threat table, putting you just at the top. You then need to stay there. Your Heroic Leap resets its cooldown and your Vigilance (talent) removes the cooldown. Mocking Banner insults all mobs within range, causing them to attack you. It lasts 30 seconds. and you can Intervene to it if, for some reason, you aren’t right there. Heroic Throw is basically a Taunt, but with an axe. Best used when Taunt is on cooldown and you need to get something’s attention. As a tank, greater emphasis is placed on the use of your defensive/survivability cooldowns than on your offensive abilities. You are not, usually, in a DPS race. Certain abilities/buffs should be up at all times. Defensive Stance should be active at all times. Flasks and any other consumables should be used. Use either Commanding Shout for more health or Battle Shout for more attack power depending on your preferences. Both last an hour. You can use a potion right before the fight is entered and another during the fight. Dragon’s Roar, if you have it. Ravager when you need the added Parry. Revenge becomes available when you dodge or parry an attack and should be used when available. Shield Slam should be used on cooldown, especially when it procs from Sword and Board, unless you’re about to cap on rage. Storm Bolt if you have it. Heroic Strike is our rage dump attack, but should only be used if that rage isn’t needed for any of your other abilities. Berserker Rage is a DPS and threat boost and should be used on cooldown. Utilize Dragon Roar or Shockwave, depending on which you selected. Thunder Clap to make sure they’re paying attention to you and to maintain the Deep Wounds bleed. Impending Victory, is a self-heal for 10% of your maximum health at the cost of 10 rage on a 30 second cooldown. This effect scales with the use of other abilities such as Last Stand that increase your maximum health temporarily. Enraged Regeneration has a 1 minute cooldown and should be used when you feel it’s needed. Shockwave and Dragon Roar are both effective AoE tools and, assuming the target is vulnerable to the stun/knock down effect, also useful methods of reducing the damage you take for a short period of time while the targets are either stunned or knocked down and therefore unable to attack. However, as Raid Bosses are immune to this effect, it’s usually more effective to simply continue your regular rotation and ignore these abilities in single-target encounters as they’re simply not worth the use of a Global Cooldown. This one goes over your talents, glyphs, abilities, and has some pretty good explanations. This one goes into the “how to tank” bits. He’s focusing on 5 mans, but some of that info will come over to the raid. Greater Mastery Taladite: +50 Mastery – much lower price. Go here if you need more gold to buy the gems. Gem sockets are actually uncommon. They have a random chance to appear on Raid gear. Also, there are no meta gems or sockets, there are no socket bonuses, and all sockets are “prismatic,” which means that they will take any available gem. The gems themselves are all prismatic, meaning they fit into any socket. None have Str, they all have secondary stats (Mastery, etc.) There are no Meta sockets or gems. If you’re under level 80 and you want to gem then go for Crit or Dodge. In Short: Enchant for Mastery, Crit if you can’t get Mastery. Warlords Notes: There are new enchants for Neck, Cloak, Weapons, and your Rings. Not for any other pieces. (Not yet, anyway.) All the older enchants are restricted to items under ilevel 600. The new enchants can be applied to lower level items, such as on the Alt that you’re working on. Enchantments for the Prot. Warrior. Warlords: All profession bonuses (such as extra gem slots with Blacksmithing) are dead, but some of the perks that you get with a level 2+ profession garrison building and a follower working there with that trait are worth considering. Especially since you don’t actually need to have that profession skill. Blacksmithing for the “no gear damage for 4 hours” will save the raiding tank a pretty fair chunk of gold. Engineering’s follower well sell you Walter, a two use combined repair bot and bank. If you just need gold then go with the gathering professions and work them hard. The crafts are for those who need every last bit of burning power. The catch is that leveling any of the crafting professions will be expensive. Check out Tycoon if you are too short on gold to level a skill. Consider getting Draenor 1st aid, you only need a level 1 skill, for the healing tonic. Put a large stack on your bars, just in case. Engineering will let you create a number of useful items, such as rockets, shields, a stealth device, etc. These cannot be used in raids or rated PvP, but can be used elsewhere. Your follower can sell you a Walter (two uses) for a very low price. This gives you bank access and everyone else (including you) access to repairs and awful food. Leatherworking You can also make Drums of Fury for a Heroism type buff (25% Haste for 40 sec.) Through the Leatherworking hut in your Garrison you can make single use tents that will increase all of your stats by 10% for an hour, though not in raids or rated PvP. These tents are account bound, so you can mail them to all of your alts. Alchemy All kinds of potions and flasks, most off of which you can buy off the Auction House for not much gold. You can also make a very nice DPS (Str proc) trinket: Draenic Philosopher’s Stone, requires Alchemy 500. This item is upgradable to 715 in 6.2. Warlords note: There are no new DPS Elixirs, but there are for Potions and Flasks. There are no Str foods, either. As with the other enhancements the foods only have the secondary stats. Potions and Flasks do have primary stats, as do the runes. Elixirs – you can have one battle and one guardian elixir up at a time. In the Mists of Pandaria the Pandarens have joined the club of Warrior Protectors. In Warlords, nothing changed reagrding which races coiuld be tanks, but all racials that had Hit or Expertise are now gone. Not all were replaced. All of the races have something to offer as a Warrior Tank, though it might not be great. For most of the races only the abilities that would have any use in a raid are shown. Night Elf for the extra dodge, slight extra movement, and extra crit or haste. Dwarves for a nice damage reduction ability and extra crit damage. Tauren for more health, the Stomp, and extra crit damage. Melee range stun has occasional use. Note that it breaks on damage. Blood Fury increases melee damage once every 2 minutes. Hardiness allows a 10% decreased stun duration, which will rarely be noticeable. Will of the Forsaken is a an occasionally really useful ability. Cannibalize for when you just have to eat the boss. Or his minions. Tauren: Maybe the best Horde Warrior tanks. Arcane Torrent is a nice spell interrupt and silence. Well ok, Blood Elves look good. A truly splending tanking ability. Really. Increased Haste when Berserk is good, but not as good as the Orc ability. More XP from beast slaying is very nice for leveling, worthless when you’re done leveling. Their Rocket Launcher will be of little use to you, as will Vendor Discounts (lower prices) and your Personal Bank, though both are nice for other reasons. Haste adds 1% to your Haste, a “meh” stat. Your Heroic Presence increases your Strength and scales with level. the escape ability is great for PvP and will break a few raid mechanics. Shadowmeld requires you to stay still. It drops aggro and can be used in combat. Tired of your group? Just Shadowmeld in the thick of things. Touch of Elune: Increases your Haste by 1% during the night. Increases your Critical Strike by 1% during the day. Escape artist has the occasional use in the raid. More – +5% higher Rage cap, which isn’t nice. Nimble – +1% more Haste, which is a poor stat for you. Always test the macros to make sure you know how they work and are comfortable with them. Because sometimes you just absolutely, positively have to cancel Bladestorm to use another ability. If Bladestorm is up then this will cancel it, if it’s not up then this will cast it. Cancel the Bladestorm and then Charge or Intervene, depending on who you have targeted. It will Victory Rush if in range. Make sure that your Berserker Rage is up before you Bladestorm. This one looks for a focus target and if it’s not there then your regular target and then pummels it. So your target (the boss, perhaps) takes a liking to another member of your team, two-timing you. For some reason you cant taunt him back. Your ally is now his target and this macro casts your Vigilance on the Boss’ target (@targettarget). Protection Warriors can level very quickly in the dungeons, with a near zero wait time in the Random Dungeon queues. They can also level at a decent speed by questing since they excel at mashing down groups of mobs. Round ’em all up and burn them down. But how best to travel through the ginormous number of quests of mobs? Where to go and what to do and what’s the best path to take to get leveled fast? For questing nothing gets you to the level cap faster than Zygor’s guide. You will always know exactly where to go and what to do, even if you just gained ten levels dungeon tanking or switched to Arms and cleared out a few of the battlegrounds. Brand new to WoW or decked head to toe in heirlooms? Boosted to level 90? Wherever you are, Zygor has your back and will get you to the level cap fast. 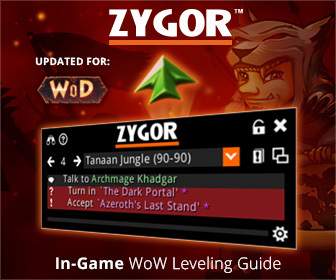 Always quickly updated to the latest expansions and patches, Zygor’s guide will get you where you want to be as quickly as is possible. Grab yours here and hit that level cap fast. Warrior overview – The top level Warrior page, linking to all the others. Warrior leveling – tips to level faster. Soooo…. where does stamina fit in there? Not a needed stat? If so, how much? Having the values of how much of a stat translate into how much of a percent. Especially the strength equates to parry value. If it isn’t that far off, strength should have a higher priority then parry stat itself since shield barrier scales off attack power. Being able to mitigate more (block) leads to much smoother incoming damage than maximizing dodge/parry, which has very spiky incoming damage. Healers don’t like spiky damage. With a higher block rate you may take more damage overall, but the healers won’t need to use inefficient “OMG he’s gonna die!” spells. Hit (to cap 7.5%) > Expertise (to hard cap 15%) > Mastery > Parry/Dodge. I agree that Expertise and Hit are important in tanking, and at present the guide is indeed using the dodge/parry focused mitigation style which I added as it was the style I was making use of at the time of my writing this guide. I intend to update it to incorporate all styles and compare the benefits in the near future. Thank you for the informative comment. You’re right: the “control” gearing strategy I advocated above is only one of the possible options. “Avoidance” (dodge/parry) and “mitigation”(mastery > hit/exp > d/p) strategies should not be discounted. Personally, I’m partial to “control” because it also happens to maximize threat & DPS while maintaining great “active mitigation.” All strategies are similar in terms of survivability as far as I know, but ‘control’ has added benefit of maximized tank DPS, which is a significant factor in raids these days. Really good info here, but i miss the sunder armor part, this ability lost his value in tanking ? been away since cata_intro untill patch 4.3, don’t know the changes yet..
Sunder Armor still has tanking value as it’s a group DPS increase and adds to the Warrior Tank’s threat. I’ll make some adjustments in the guide. Thanks. -Rog. Wow, love this ! Very detailed, and great info easy to grasp. Warrior is alt but will be my next 85 and my go to tank! Ty I am excited about playing this toon now!